Here is a little story about my dad, Mr. Ezra Clayton “E. C.” Bowen. 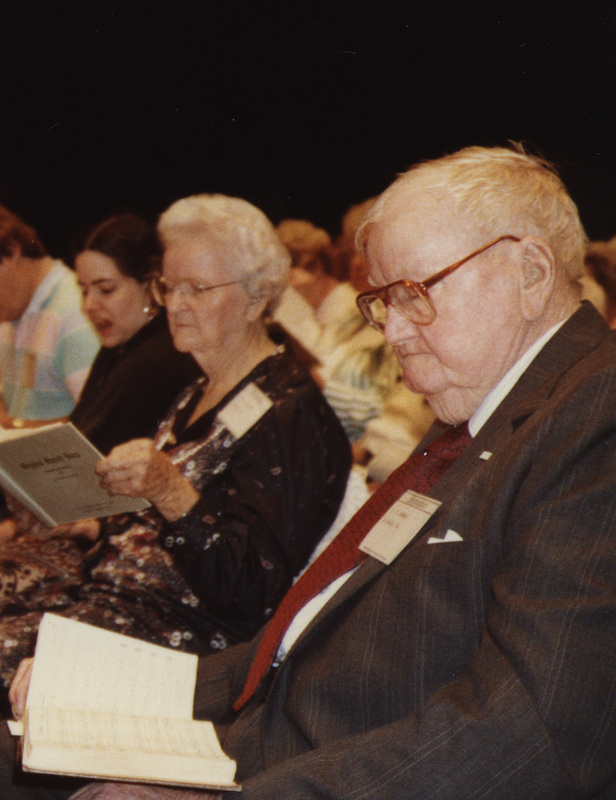 E. C. Bowen at the 1989 National Sacred Harp Singing Convention. Photograph by Ginnie Ely. Collection of the Sacred Harp Museum. My dad was born on May 25, 1905, in Woodland, Alabama. He went to a few Sacred Harp singings with his grandmother when he was young but he and his parents did not sing. As a young man, my dad served in the Coast Guard for two years. Back home in Alabama he worked as a farmer. In 1948 he met my mom, Agnes Ozburn, through a friend of his sister. Agnes was born in Atlanta. Her mom had left the family when Agnes was just two years old. Agnes was a very kind lady and she and my dad got along, so he moved to Atlanta so that they could marry. One of my dad’s jobs in Atlanta was with the Stanford Coffee Company where one of his co-workers was Sacred Harp singer and composer A. M. Cagle. My dad and Mr. Cagle were friendly at work, but Sacred Harp singing never came up. My mom worked taking care of elderly ladies who came to stay with us in our home. After my dad left Stanford Coffee, he went to work as a taxi driver in downtown Atlanta. He stayed in this job for many years, making about $15 per day, enough for us to get by. Outside of work, my dad followed baseball and football, and liked crossword puzzles. One day in 1970 he saw the Chattahoochee Convention advertised in the newspaper and decided to check it out. So he went and he just fell in love with Sacred Harp singing. He heard singers mention Cagle, who had died in 1968, and realized they were talking about the man he had worked with. I began going to singings with my dad soon after. I was nine years old. My earliest memory of going with him is of March 1971 at the Georgia State Convention at New Hope Primitive Baptist Church in Villa Rica. I remembered that because Georgia Public Broadcasting filmed the convention for a program on Sacred Harp singing and when they broadcast it, I remembered waving at the camera. West Georgia librarian and Sacred Harp singer Myron House interviewed E. C. Bowen at the 1982 Florida State Convention. Collection of the Sacred Harp Museum. My dad went to a singing somewhere every weekend as long as he was able. He especially supported the Georgia State Convention and the Holly Springs and Mt. Zion Memorial Singings. He was the chair of a little singing at Pleasant Grove Baptist Church in Haralson County, Georgia, held on the second Sunday in July that happened to be the same day of his funeral. He served as chaplain of just about every convention he attended. E. C. Bowen (center), flanked by Jeff Sheppard (left) and B. M. Smith (right), on the front bench of the tenor section at the 1988 Illinois State Convention. Photograph by Janet Fraembs. Collection of the Sacred Harp Museum. My dad loved Sacred Harp music and Sacred Harp singers. Three of his favorite songs were written by a McGraw: “Mars Hill” and “My Life and Breath” by Hugh and “Sabbath Morning” by H. N. (pp. 517, 527, and 283 in The Sacred Harp). Other favorites were “Fleeting Days,” “Big Creek,” “The Resurrection Day,” and “Peace and Joy” (pp. 348b, 494, 498, and 532). Hugh McGraw was one of his closest singing friends. He loved Charlene Wallace. He was close with Lonnie Rogers, Jeff Shepherd, Elder Homer Benefield, Richard DeLong, Kathy Williams, Loyd Redding, Buford McGraw, and Bill Avery. Though he didn’t know her well, he often told me that he thought a lot of Judy Mincey. Outside of Sacred Harp, my dad went to “new book” gospel singings some, but not often. His real love was Sacred Harp. My dad believed in keeping all the traditions of Sacred Harp. One example is from the Chattahoochee Convention. At the end of the singing one year, the chairman called a last song other than “The Parting Hand” (p. 62). My father told the chairman, “You are supposed to sing ‘Parting Hand’ as the closing song,” and the chairman changed his selection. 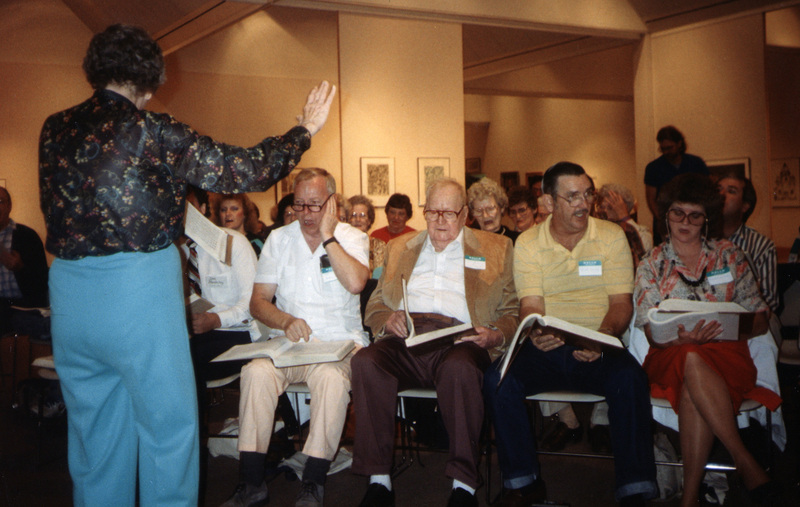 E. C. Bowen (second from left, back row) and Don Bowen (kneeling, far left) on a bus trip to the 1988 Illinois State Sacred Harp Convention. Photograph by Janet Fraembs. Collection of the Sacred Harp Museum. In May of 1993, I went with my dad to the Midwest Convention on a tour bus for singers organized by Mrs. Ruth Brown. During the trip my dad became very sick. Ruth Brown told him he needed to stay at the hotel, but he told her he didn’t come to stay at the hotel, he came to go to the singing, so he went. On July 9, 1993, my dad passed away. The next year, at the Georgia State Convention in March of 1994 at the DeKalb County Courthouse, the executive board members of the Sacred Harp Publishing Company gave me a citation in his memory for all his work in Sacred Harp. My dad loved the singing but I believe he loved the people he sang with even more. Sacred Harp singing drew him closer to God. Just like for me, it meant the world to him. Don Bowen lives in Cartersville, Georgia. He is a member of Grace Baptist Church. He has been singing Sacred Harp since 1971. He enjoys sports and loves to watch Sacred Harp videos on YouTube. This entry was posted in Citizen of the Month. Bookmark the permalink.